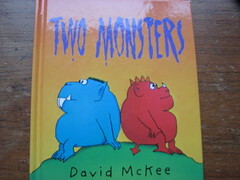 It’s not been easy deciding which book to share for my first Book Sharing Monday post, but I have settled on “Two Monsters” by David McKee because it has been a favourite of first Gman’s and then Waif’s, and it’s a fun book for adults to read aloud too. 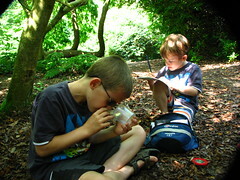 The story tells the tale of two monsters who live on opposite sides of a mountain. One evening, at sunset, they argue about whether it is day departing or night arriving, and start to trade insults and throw rocks. Over the course of the next day, they throw so many rocks that there is nothing left of the mountain , at which point they can see that they were both right – day departs as night arrives – and settle down to watch the sunset together. 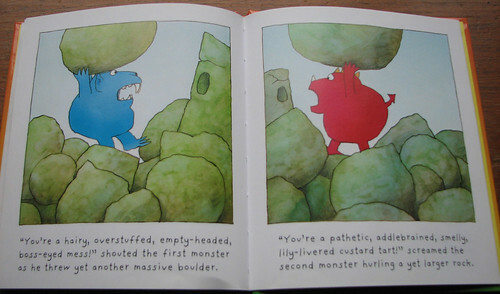 One of the highlights of the book for my boys has been the extraordinarily colourful and humorous insults – our favourite is “You’re a pathetic, addlebrained, smelly, lily-livered custard tart!“- you’ve got to love David McKee and I’m sure we’ll be sharing more of his books on Mondays to come.